The original Toyota Land Cruiser you know as a rugged adventure icon is called the FJ40, or “Shorty Forty” because of its relatively short wheelbase. 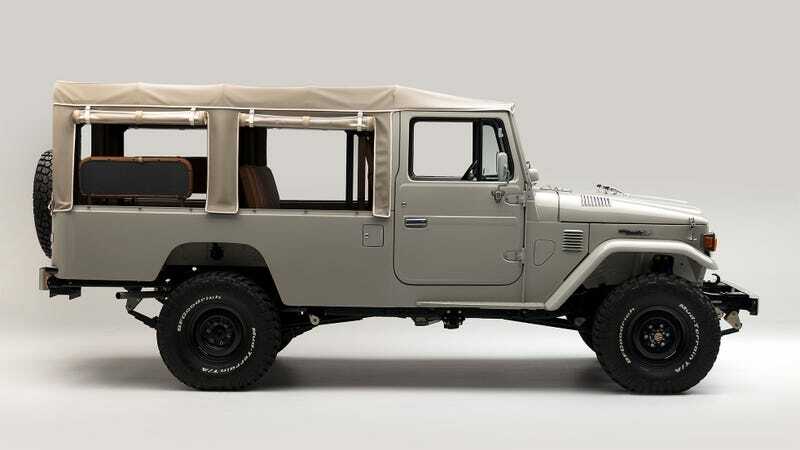 Since then there have been many Cruiser variants over the years, but the 40’s big brother the FJ45 is one of the coolest and least-appreciated. This restored and upgraded example is particularly lovely. 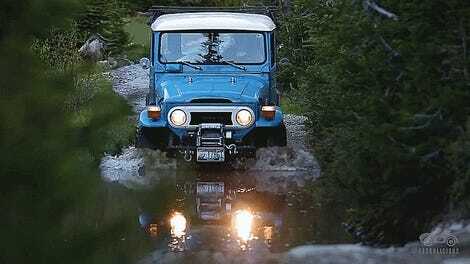 The FJ45 was built in Japan from 1976 to 1986, primarily for passenger duty over rough terrain. The trucks had as many as 13 seats, and as you can see this one has five front-facing and two big center-facing benches in the cargo area. You might hear these long wheelbase Land Cruisers referred to as “Troopys” in reference to their jobs as military troop carriers. Toyota kept the body style through generations, and Troopys were continuously built alongside Land Cruiser pickups and short cab SUVs for decades. Our model selection in the U.S. was a lot more limited, as we only got the four-door wagon versions, making the Troopy that much more interesting. In fact, I’m pretty sure I’ve never seen one of any generation in America before. This 1981 Troopy was revived by The FJ Company, which specializes in turning old Land Cruisers into excruciatingly detailed works of art like this FJ40 it did up last year. This truck has had a full frame-off restoration, a custom soft-top stitched up and a fuel injected Toyota 3F engine (like you’d have in a later Land Cruiser) dropped in. The old shocks were replaced with Old Man Emu (ARB’s brand) shocks, and the interior... man, that interior. What a color! It’s vinyl, not leather. I would have used more cloth and wood myself but this came out pretty darn dandy. Looks like just about every switch and accessory inside has been replaced and polished. A representative of The FJ Company told me that if a customer were to order a truck like this, it’d cost between $125,000 and $150,000 depending on specs. So if you’ve got one of these things rotting in your backyard, for the love of all that’s holy hang on to it until you’re ready to retire! This one looks cool, without a doubt. Gorgeous, even. I’m still a little conflicted about the whole idea of turning a work vehicle into something too pretty too abuse, though. In a way, this is kind of a perversion of what an old Land Cruiser is all about. At the same time I want to curl up and fall asleep on that saddle-colored upholstery for the rest of my life. Ditching the clunky old carburetor is definitely cheating, though. I sure wish I could afford to do it on my truck.